This hotel is right on the sea at pretty Cala Vinyes in Calviá, and enjoys spectacular views to the east across the bay of Palma. There's a spacious terrace with a large swimming pool and the sandy beach is a short stroll away. The location is conveniently close to a host of places such as Santa Ponça's shops, bars, restaurants and golf courses, or the Blackpool-like atmosphere of Magaluf. Palma airport is only 20 kms away and the historic city of Palma about half of that. Hi! 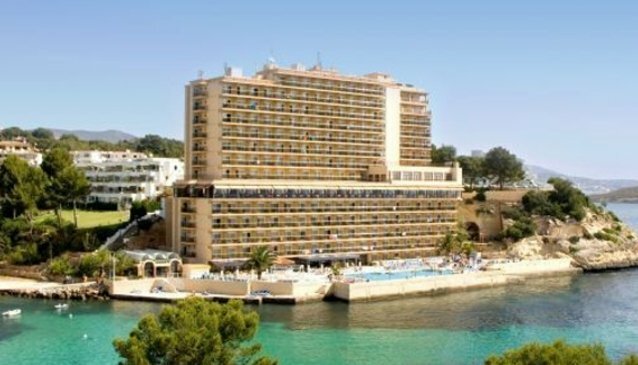 Hotel Cala Viñas is essentially a resort hotel and offers all inclusive rates and plenty of activities.